A 12-page educational pamphlet printed in a newspaper format. 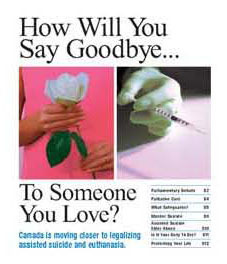 It features articles on Bill C-407, Palliative Care, Safeguards, Elder Abuse, Disability concerns, etc. Available online in pdf format (requires Adobe Acrobat Reader).